Holidays are very food laden. In fact, they are the most gorge-worthy days of each year. I know the holidays I celebrate involve huge family meals with all the fixings, including plenty of desserts. Not every holiday has to feature menus loaded with fat and calories. Check out this lighter version of a New York-Style Strawberry Cheesecake that is just 380 calories per serving (traditional is roughly 450 calories). Line 13x9-inch pan with aluminum foil, with ends of foil extending over sides. Combine graham cracker crumbs, 3 Tbsp. sugar, and butter. Firmly press onto bottom of the foiled-lined pan. Bake 10 minutes. Beat Neufchatel Cheese, 1-cup sugar, flour, and vanilla with mixer until blended. Add sour cream; mix well. Add eggs, 1 at a time, mixing on low speed after each just until blended. Pour over crust. Gently drop small spoonfuls of strawberry purée over batter; swirl gently with knife. Bake 40 minutes or until center is almost set. Allow to cool completely -- about 15 to 20 minutes -- before refrigerating for 4 to 6 hours. 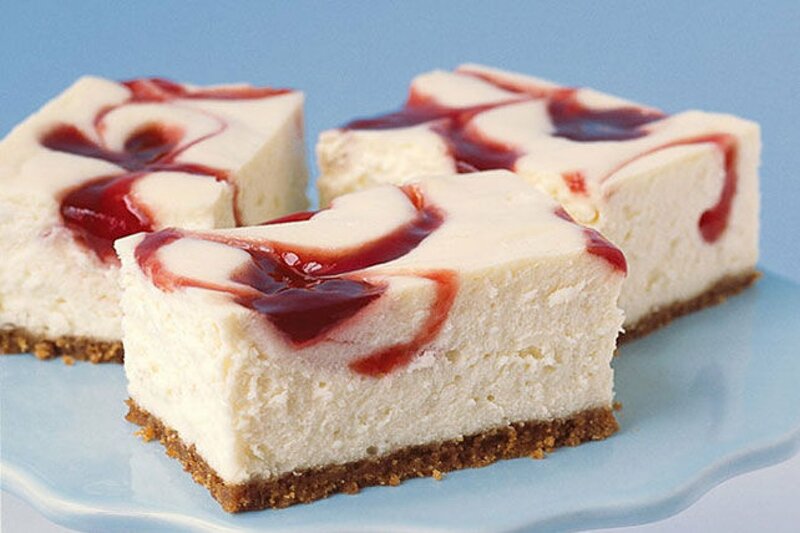 Use foil handles to lift cheesecake from pan before cutting to serve. If you want to reduce the amount of sugar in this recipe, substitute 1/4 cup Splenda Granulated No Calorie Sweetener for the crust and 1-2/3 cups of Splenda Granulated No Calorie Sweetener for the filling. This substitution will bring your calories down to about 280 calories per serving. I find Splenda to be sweeter than sugar so you may want to adjust the amount to suit your taste.